CynerGreen has launched an eco-friendly kids line of products, created for and by kids, CGKidz. “Green stuff for kids by kids.” The CGKidz website is even managed by 11 year old Riley Hoffer (daughter of CynerGreen Founders) who designed the CGKidz bottle which is a 304 stainless steel water bottle, a 500 ml size with a twist cap and silver carabiner (which my nine year old daughter totally loves, she can clip it right onto her belt loop and carry it around with her). Proceeds from the sales of the official CGKidz bottle will be donated to schools across the country that need assistance to fund green initiatives. Riley is an active member of the CynerGreen team and travels with her parents to talk to kids about the importance of being green. She’ll be speaking at the Gibson County Day School’s Green Fall Festival in Annapolis, Maryland on October 18, 2008. The Gibson County Day School is one of the first certified green schools in Maryland. 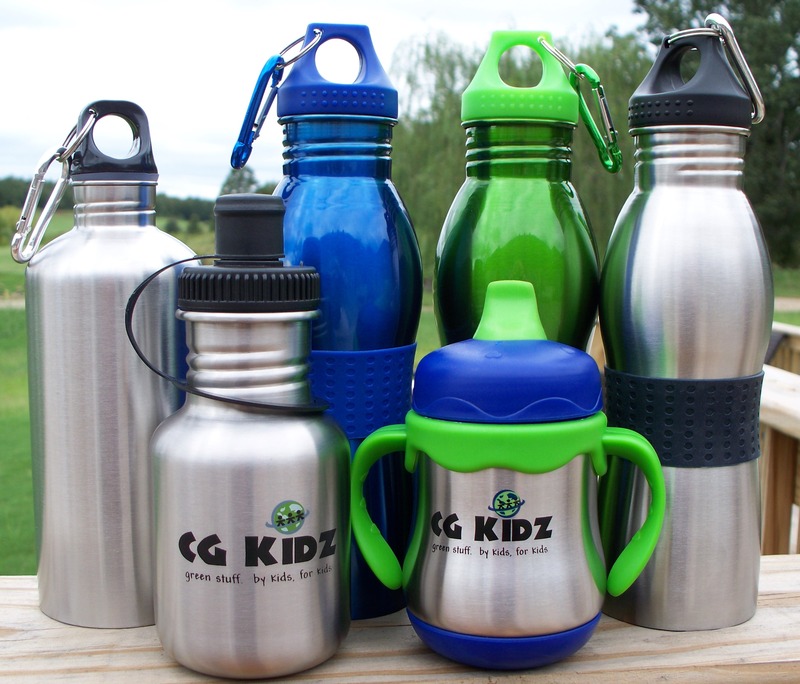 In addition to the CGKidz official bottles there are other bottles and eco-friendly products for sale on the CGKidz website as well as product reviews by Riley and tons of info and ways kids can get involved with being green. It’s a place kids can learn more about what they can do to help save the environment. My kids and I had the chance to sample a few of the CGKidz bottles, including the official bottle and I have to say…we love them. I was afraid the stainless steel would make the water taste funny but it doesn’t and my kids really love the design of the bottles. My 9 year old loves the one with the clip so she can carry it around hands free and my little guy loves the one with the spout top like a regular water bottle. I like them both. They are a convenient and safe alternative to plastic water and sports bottles. I think I need a few more so I can keep my fridge stocked with safe, reusable water bottles. So how do I purchase a bottle? Wow. It’s SO awesome to see people from all over making conscious efforts to live a greener lifestyle! I think if more and more people thought this way, a lot could really be done to save our beautiful planet. Keep talking up the eco-friendly lifestyle. We could all make a difference :). Thanks for the post, it was so awesome to see! I purchased three water bottles for my grandchildren. They worked fine until I put cold water with ice in them. Then the metal must contract, and the seal does not hold. All the tops fall off. I would gladly send then back to you for a full refund of $21.00. I’d appreciate a response to this email. You say the water bottle is stainless steel and ALUMINUM. ALUMINUM is toxic. What part is aluminum.